Children need comfort when doing school or computer work, just as you do at a office. School furniture in a range of heights allows you to fit a child to the correct desk size for their age. School furniture and desks are available in fun, bright colors and sizes from 30 to 36 inches in height and varying widths to fit in any space available. Giving kids the correct tools helps them focus on the current task with fewer distractions. Kids chairs are as important as their desks. We offer adjustable kids furniture including kids chairs to keep them comfortable as they work. Adjusting a chair to the correct height prevents loss of leg circulation and prevents your children from tucking their feet under the chair to cause stress on small joints. 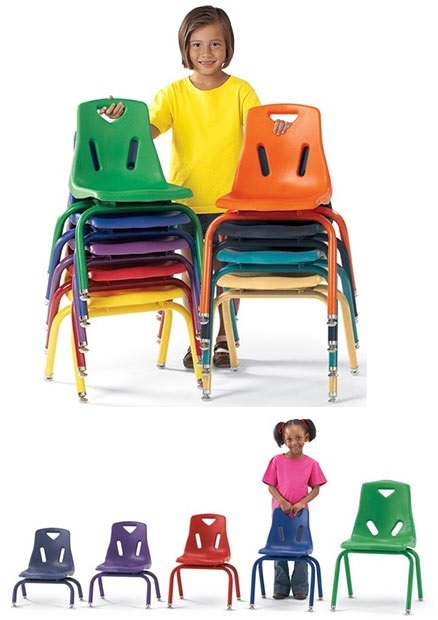 Select kids chairs in a color to match desks to round out and coordinate a classroom. You can choose bright-colored kids chairs with a mesh back for increased airflow in a smaller or warmer space, or a new-style curve back chair. For the sports-loving kids, you can choose a chair in a theme to match the interests. You can choose comfort and safety while your children receives a fun atmosphere for study time. Contact us to learn more about our adjustable kids furniture, kids chairs, kids storage furniture or the missing piece needed for your school furniture.